Last year I bought an old Minolta Autocord twin-lens reflex camera off the ‘bay. While not as famous or desired as the Rolleiflex, those who have owned them say they are great cameras. Mine dates to the 50s or 60s and has a built-in light-powered meter that uses no batteries, a very desirable feature. 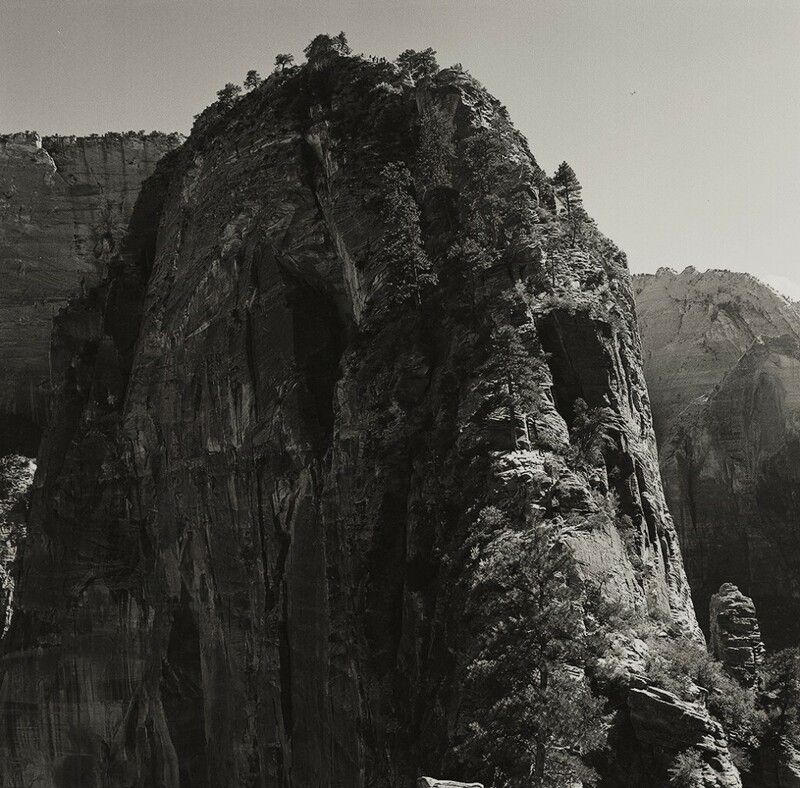 It also has a fantastic lens which really flexes its muscle taking landscapes. I had to go to California in October for work and since I dislike air travel and always wanted to drive across the West, I did. I brought my new camera with me as well as my trusty Minolta X-700 manual-focus SLR. amazing. 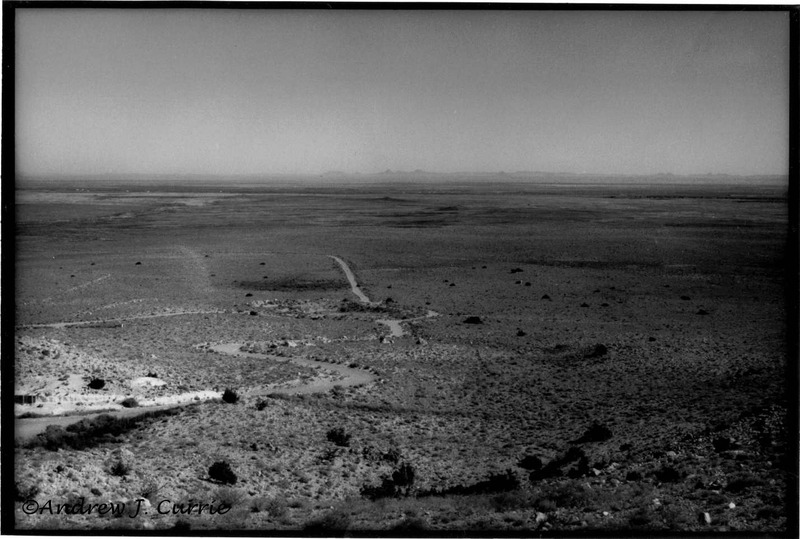 The road visible in the image is the access road that leads to Interstate 40, 6 or 7 miles distant. 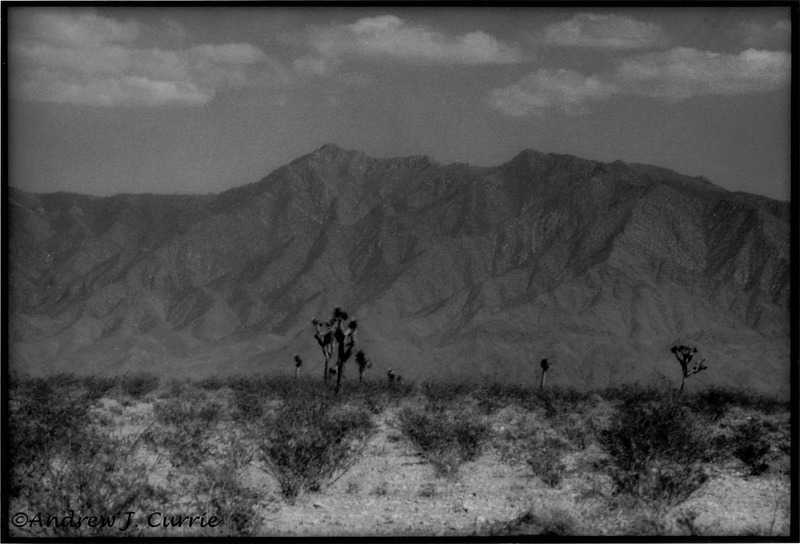 Before entering California, I stopped to shoot another photo of the desert with the amazing mountains in the distance. While I was in Los Angeles, I took a few photos in El Segundo. While LA has a reputation for smog, it seemed to me to be more foggy in the morning. 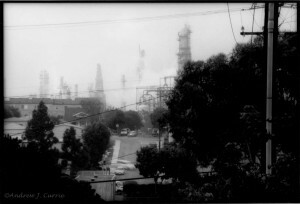 There is a concentration of heavy industry near the beach in El Segundo, which provides a nice contrast to the stereotype of the sunny Southern California. 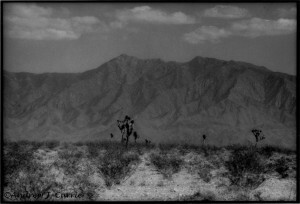 This shot was taken from a side street off of Mariposa Ave. The street was on a very steep hill, giving way to a rare long-distance view. After finishing work the real road trip began as I headed east. After escaping the LA area and sleeping in Barstow, the next day I drove through Las Vegas to Saint George, Utah, where I stayed at a friend’s condo for a couple of days to explore nearby Snow Canyon State Park and spent a day hiking in Zion National Park. 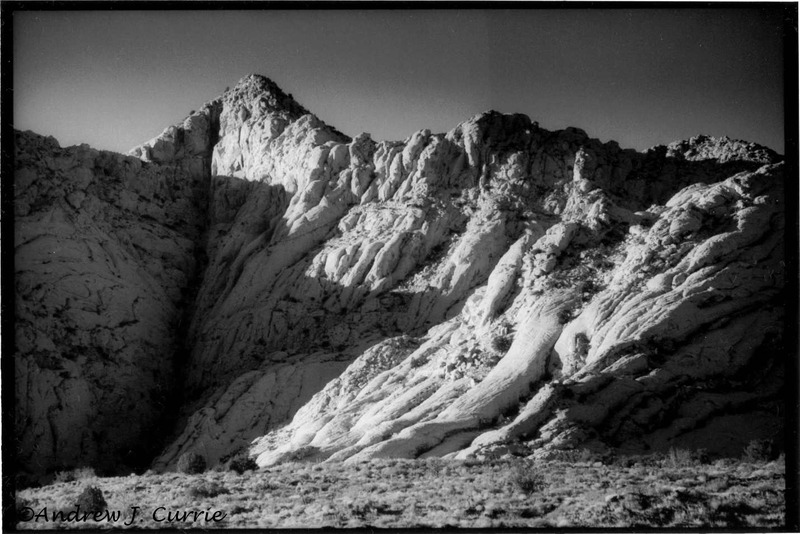 Snow Canyon is a short drive from St. George, so I was able to get to it on the day I arrived. 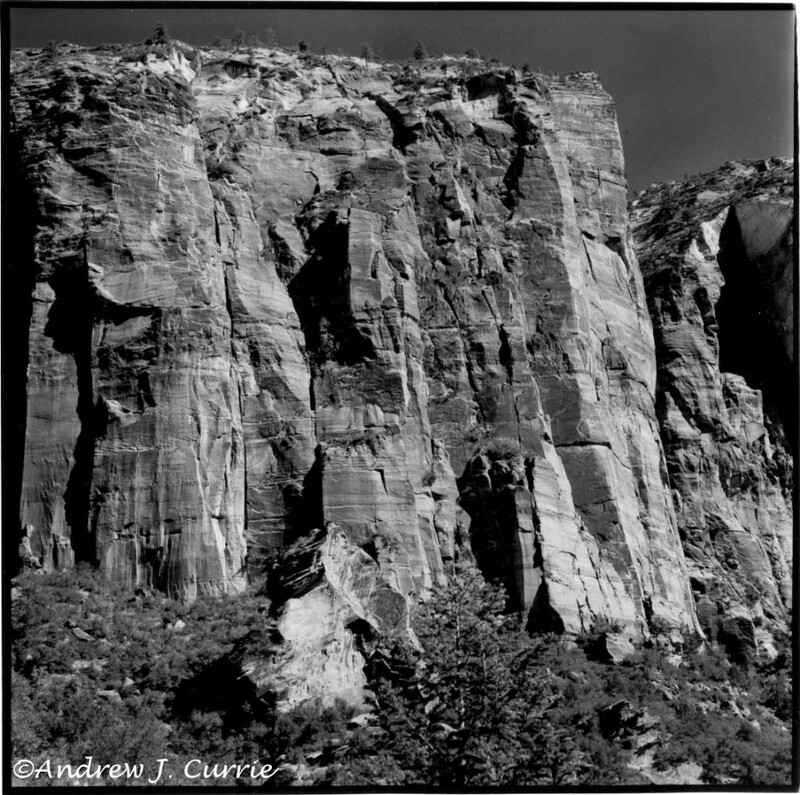 While black and white film can’t capture the red color of the rock, it excels at the texture and shading of the terrain. 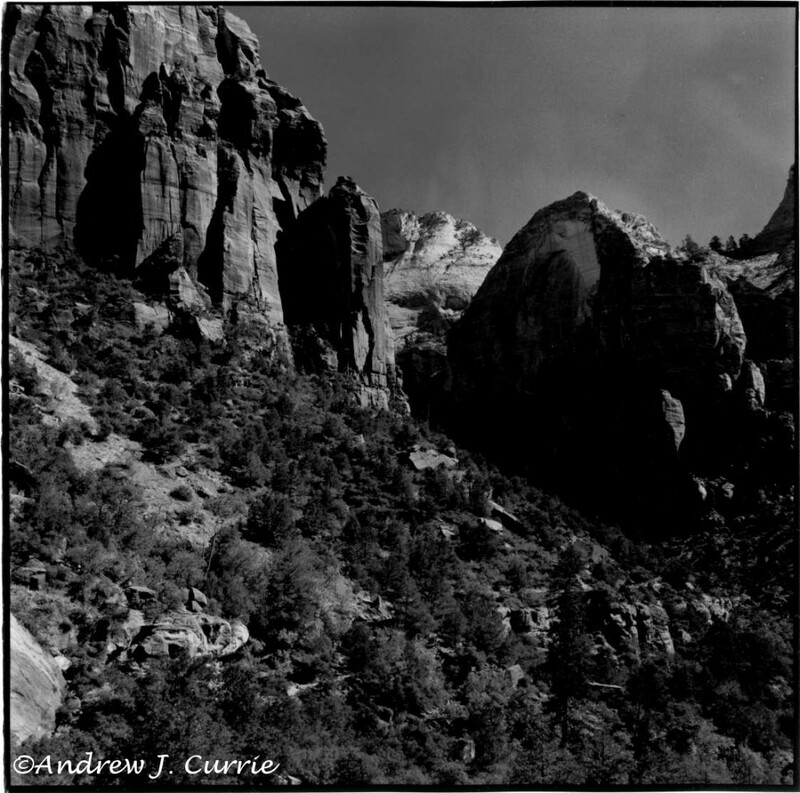 The following day I got up bright and early, packed my Camelback with water and photo gear, and made my way to Zion. 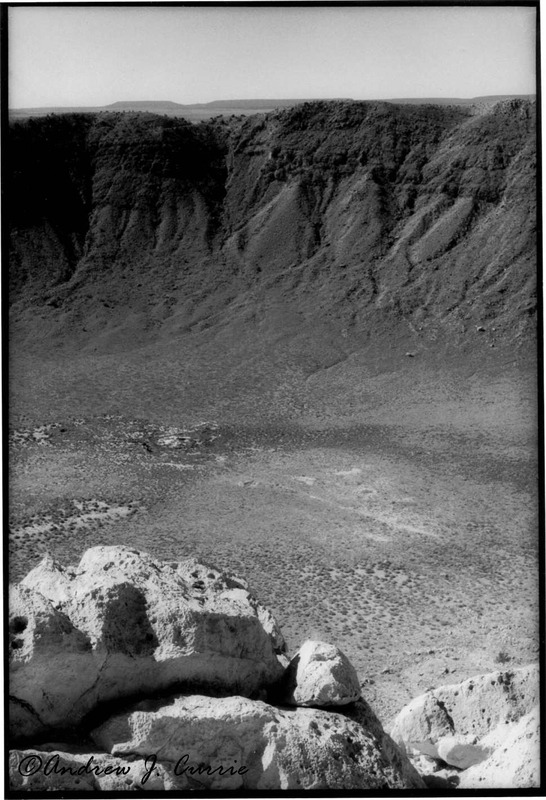 I used to think I would find the desert a boring place with all rock and sand and no trees. How foolish that was! 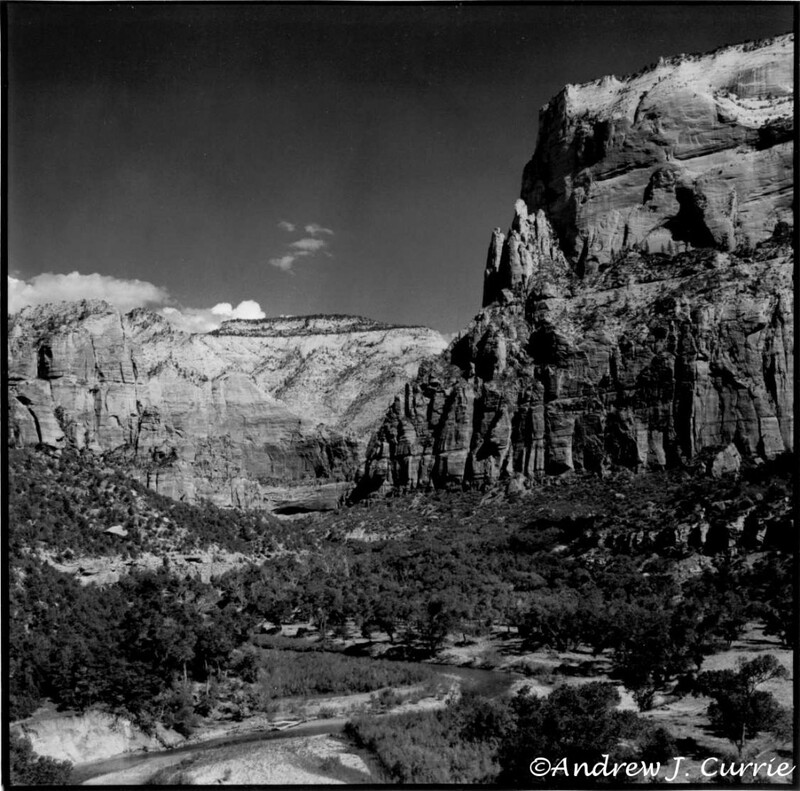 Zion is mostly a large canyon with a river and a road running through the valley and enormous vertical rock walls on either side, with lots of steep and challenging hiking trails. The first place I visited was the Emerald Pools, which is a small body of water some distance above the valley floor, nestled inside a U-shaped rock wall. 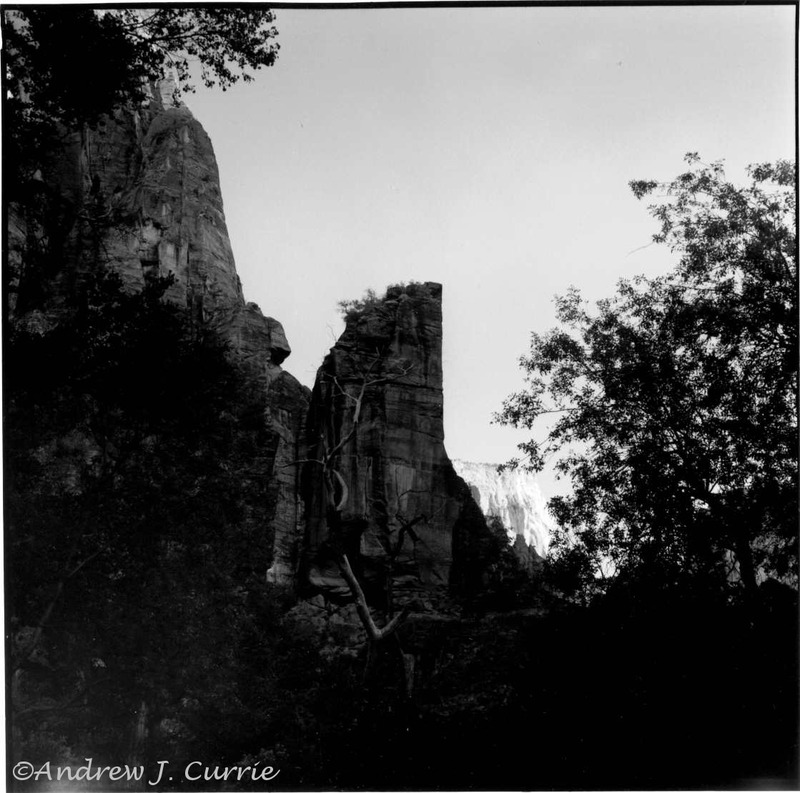 By now I was using my new medium format Autocord, which makes 6cm square negatives. This was my first hike of the day, but certainly not the toughest. I hopped on the shuttle bus to make my way to the trailhead for Angel’s Landing. From this very steep and high trail the views of the valley and surrounding cliffs and mountains is spectacular. 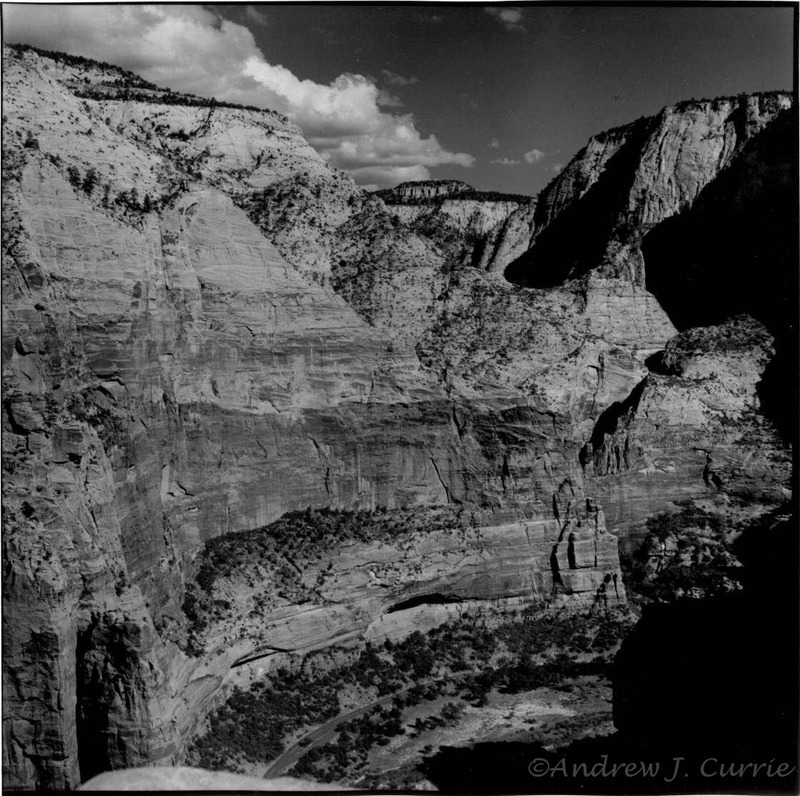 The Angel’s Landing hike exhausted me and depleted my water supply, so the rest of the day involved moving by shutlebus and in my truck. The shuttlebus takes you to the end of the canyon, to a place known as the “Temple of Sinawava”, which is where the canyon walls close in to form a natural amphitheater around a large rock formation known as “The Alter”. The river comes through a narrow opening in the back of the amphitheater and a rugged hiking trail winds its way through. After riding the bus back to the parking area I drove my truck up the road through a pass along Highway 9. It was late in the day and the light was starting to fade, but I managed a few more photos. The verticals in places like Zion are truly amazing, it’s difficult to convey the scale and impact of this in 2-dimensional photographs, but sometimes the camera manages to convey this. 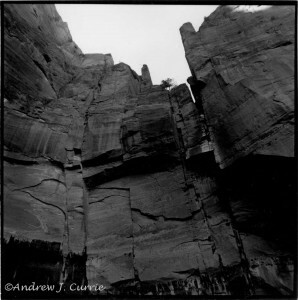 Massive vertical terrain in Zion. 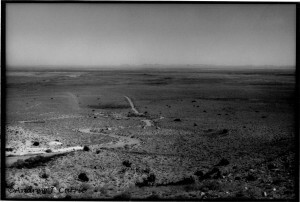 Note the car moving along the road below. That was it for the western side of Utah. Be sure to watch for Part 2 of this road trip, where we explore Arches National Park!